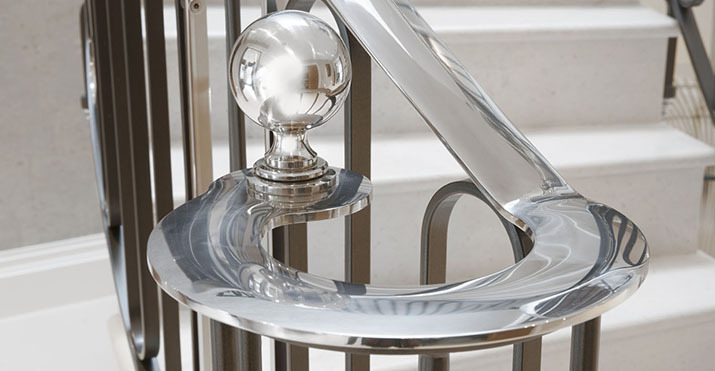 Clifford Chapman Staircases has gradually built up an excellent reputation for providing high quality metalwork for the leisure industry. Our craftsmanship can be seen in theme pubs, leisure complexes, exclusive fashion stores and even in the homes of the rich and famous. The finished creation is not only functional but elegant; a perfect combination of beauty and strength. Our work can be seen not only in Britain but throughout the world! As the saying goes “First impressions count.” We have been commissioned to produce work for the entrances to some of the most attractive structures built in recent years. Whether it’s the swooping arc of a three-storey restaurant or the steel and glass portico of an office block, one thing is guaranteed, it will certainly be distinctive. Creating a ‘Stairway to Heaven,’ from a design by Eva Jiricna, the internationally renowned architect, gave Clifford Chapman one of his proudest moments. Working with a designer of her standing is praise indeed, and this was to be the first of many collaborations with Eva. If ever there was an example of a designer and craftsman working in partnership to create beauty and strength, then this was it! What looks terrific on paper as an artist’s impression might not be possible when it comes to manufacturing in metals and glass. This is where Clifford Chapman’s reputation as a problem solver was established. We work very closely with the architect or designer and when a potentially difficult situation arises in the manufacturing process, we will supply a solution that will not compromise the design in any way, but will actually result in the job progressing rather than being halted. A great amount of effort goes into the detail, something we believe sets us above our competitors. By utilising our vast experience we have met whatever challenge has been presented to us, as architects and designers that have worked with us will testify. Whenever a technical problem has been raised it has been resolved, and not at the expense of the design. In many cases it has actually enhanced the finished effect.